With New Year’s behind us, and the completion of our 5 part Coaches Spotlight Series, we welcome you back to your regularly scheduled programming, with an episode all about cardio. 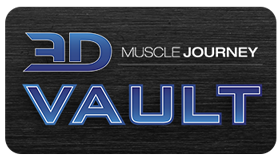 Andrea, Eric and Brad join together to discuss practically everything one could want to know about programming cardio for themselves, and for their athletes. What is the “interference-effect” of cardio, and what can we do to mitigate it? Are there different programming strategies when it comes to prescribing cardio for a physique athlete versus a powerlifter? 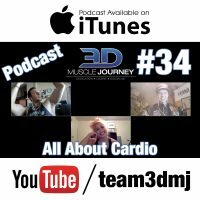 As a team, what is 3D Muscle Journey’s general philosophy when it comes to prescribing cardio? Along with answering these questions, the group also list a few of their personal favorite cardio modalities when it comes to exercise prescription for their athletes, and delineate the difference between commonly misconceived endurance training, from low-intensity training. Join us this week to hear the answer to all these questions, plus many more…All about cardio! Thanks for all the great free content you guys are the best! How would you all suggest programming cardio in for an off-season bodybuilder/ gen-pop athlete wanting to do Sprint Triathlons (about 1.25 hours in total race time), or any other type of race training in with their weight training? I currently do “power-building”, so hyp focus for 3 days then strength focus for 3 days with a P-P-L split. Should I try and keep movement patterns together i.e. bike on leg days and swim on back days? Or split similar movement patterns up from each other? Or just reduce training volume when Triathalon training? I’d like to do each activity individually once a week and a mach Triathlon every Saturday. I have been lifting weights for 4+ years and would like to try out “sprint” triathlons in the summers. Thank YOU for engaging with our content, Akiem! And while all of your suggestions of volume manipulation seem to be decently logical, it’d be remiss of me to say that any of it is correct or incorrect for you, as I do not have any experience with coaching endurance athletes. As mentioned in this particular article, our focus is on the strength training, and the cardio pieces should not interfere with that. But if you would like to compete in endurance sports, then I would suggest maybe giving THAT a priority and simply doing strength work that would not interfere with that. Simply put, rather than going all in on both goals all the time, would it maybe be best to have seasons where one takes the higher priority for certain amounts of time than the other? This way you could preserve recovery mechanisms and keep injury risk low? That said, I am speaking in generalizations based on what I would do with most lifters who come to us for coaching. I know many crossfit athletes are able to perform strength and endurance within their year. But I also know a lot of them usually periodize and emphasize different areas of their fitness at different times of year, so perhaps seeking advice from a knowledgable functional fitness coach would be best here, as we simply aren’t experienced with training for both of these goals at once. Thank you for the repose! In the past, that is what I leaned towards (focused more on endurance before the races, then back to strength and lifting afterwards). I figured that is similar to what a lot of strength training athletes do when it comes to training for power-lifting/ hypertrophy focusing on one main goal at a time.